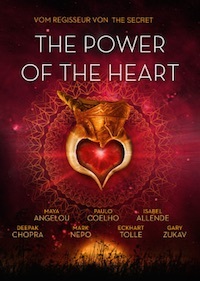 Baptiste de Pape is the producer of the movie „The Power of the Heart“, where great thinkers of the modern age gather and talk about exactly that: the Power of the Heart. Is this the first time for you in Germany? No, a brother of mine lived in Berlin for two years and in Heidelberg, so I’ve been to Berlin, Heidelberg and Munich many times. I’ve been to Frankfurt, Hamburg. And I love every city I’ve been to so far. For the project we’ve been to Munich, because one of the people in the book, Ruediger Schache, lives in this area, just outside of Munich. So there is nothing specific you want to see, now that you are here? Do the typical tourist-thing? Well, I would love to go to the cathedral. I have never been here as a tourist, because it was always for work and I would love to be here as a tourist one day. I came from Paris and flew to Brussels and now I am here. I’m just here for the day. Tomorrow I’m going back, so unfortunately I won’t have the time – although I’m trying to get my companion to accompany me to the cathedral, since we have one hour left before we have to be at the cinema. I wish you good luck then. While you were filming, was there one person in particular that made a big impact on you? All of them, but I think, Paolo Coehlo the most. We interviewed him in his home and he is one of the best-selling authors of our time. His book „The Alchemist“ alone sold so many times and many people consider his work an inspiration. He said, that we could do the interview in his home, and I thought that we might have an hour to talk about the power of the heart. When we came in, he offered me a cigarette – I just had quit smoking … But when Coelho wants to smoke with me, what to do? So I said yes, and he made selfies with me. What’s remarkable is, that he has a little ponytail and you don’t know that, because in his author pictures he’s always looking straight at the camera. Funny enough, we stayed six hours. He was very gracious. He offered more coffee and such. He was so nice and so interested! 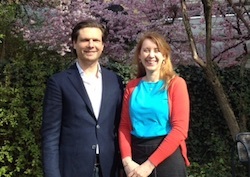 I felt a lot of connection with him, because he also went to law school, although he didn’t finish it and I did. But there was always this feeling in him, that he wanted to do more, like me. The other person who made a big impact was Eckhart Tolle. He’s originally German and now he lives in Vancouver, Canada. We stayed a weekend in his holiday home on a little island before Vancouver. You can only get there by water plane and that was an interesting thing with all the cameras and stuff we had to get there. But we managed it. I spent a weekend at his home. He loves a good cigar, good wine and good jokes. After Germany, where he was born, he lived in England at Cambridge University and when his awakening started, he moved to San Francisco. He could only write on the West Coast of the USA. When he was there, he told me, the writing came to him. When he went back to England or Germany, he could only do some editing. So he couldn’t write. Now he lives in Vancouver which is also the West Coast in a way. That’s interesting, that the inspiration seems to be geologically based. Yes, we talked about it, that there are places where you seem to be able to get into the flow and others, where you cannot. Gary Zukav, one of Oprah Winfreys favorite authors – „The Seat of the Soul“ (Die Spur der Seele), has had the same experience. He lived on the East Coast, but when he wanted to write he had to move to the West Coast. We talked about how places can help you with writing. And Tolle also had the „Red Book“ (Das Rote Buch) of Carl Jung. It’s lying in the living room. He is very interested in synchronicity and such. Was there one person whom you interviewed who surprised you? Who was different than you would have thought? They all surprised me, because the subject is the power of the heart. What suprised me most was, that they all showed their vulnerability. Sometimes you talk about love and fear. And they all said that they are sometimes fearful. It is not bad to have fears. The only thing bad would be to be paralized by fear. If you see the movie you will see, that they all talked about very private subjects. Isabel Allende talks about the loss of her daughter. Her daughter came into a coma because of negligence and malpractice at the hospital. Eventually she had to let her go, because at the end she was like a plant. What surprised me was that they were all so open about their vulnerabilites. It showed me that I could also do that. I learned that what makes you vulnerable makes you beautiful. If I can show my vulnerability instead of brushing it off, because you could hurt me then … If I show myself and my vulnerability, there is the chance that it hurts, but there is also the possibility that I make a real connection with a person. And what I noticed from interviewing all those people was that they all have the courage to show that. I thought: Okay, what makes you vulnerable makes you beautiful, but in a sense also more powerful. Now I notice in my travels all over the world, that many people start crying when watching the movie. Afterwards all the people come to me and they start to share their personal stories. Very personal. I get stories like child prostitution, cancer, lost children … I don’t know those people, but because the people in the movie share their story and we connect through personal soul stories, it gives the people permission to share their own stories with me and each other. Think about one thing: the word courage comes from the french word „coeur“, meaning heart. So it is a courageous thing to do to share your vulnerability with another person. How did you choose the people you interviewed for the movie? When I started the research for the project I started with a research for the heart. Of course, you have the science with HeartMath Institute and such, but I started with all the old spiritual teachings and religions. The heart is described as a source of wisdom, intelligence and power. And of course it would be a bit difficult to interview Jesus, Buddha, Laotsu, Mohammed or other masters … So I thought about who are the masters of the heart for our time. I remembered the first time I had seen Maya Angelou on television. That was on the first inauguration of Bill Clinton when he became President. She was reciting a poem. And in this poem she encourages us to listen to our hearts. And I remembered the first time that I read „The Alchemist“ by Paolo Coelho. It is a book about a shepherd boy who learns to follow his heart. And when I read „The Power of Now“ and after that „A New Earth“ by Eckhart Tolle, I realized the alignment between the present moment and the heart. Deepak Chopra, Jane Goodall … That was how I chose them. And of course, the science is also very interesting. Because HeartMath shows us for example, that the heart can see events before they take place. It is a scientific explanation for our intuition. What would you say is the advantage of doing both a movie and a book? At first, I didn’t want to do a book. Okay, I didn’t know that I would be doing a book. I wanted to do a movie and I was surprised that they all said yes. There are really big names on our screen! But they all said yes and I sometimes interviewed them for hours, not just thirty minutes. So we had so much of this great material of all those wonderful people … and the movie is only ninety minutes … I sat in the studio and was depressed because all those great things would have to be cut out. And then I thought: The only way to share more, is to write a book. There is more information. So, the advantage in reading the book is to get more information. The movie opens your heart directly. It’s a direct experience. And then you want to know more and can get the book. That’s because the director of both movies is the same: Drew Heriot. I hired him. You can see the style is similar. But I think that might be a new trend. If you want to do a movie about a spiritual theme you do it like „The Secret“. Okay, what’s your next project? At the moment I am traveling the world to promote „The Power of the Heart“ all around the world. I will be doing this for the rest of the year. Next year I want to publish a new book about how manifestation works. The title will be something like Manifestation – Manifesting from the intentions of your heart or of your soul …. Right now it can still be changed. The reason is that I lived together with Drew Heriot who made „The Secret“ for eight months while we were working together. We had lots of conversations about it. How does it work, how do you manifest. In „The Secret“ they talk about how, if you want something, you visualize it, feel it, then you can have it. But I think there’s something deeper. I think that if you have the intention of manifesting something, you first have to ask where this intention is coming from. Is it coming from my heart or does it come from my ego, my personality? I believe, that intentions that come from the heart are supported by the universe and then you have those synchronicities and you meet the right people at the right time, etc. That will be my next book. I won’t be producing a new film next year, but maybe in 2017. I’m looking forward to that! What are you most excited about the coming journey? I’m really enjoying this year, because I am traveling all over the world. As a producer you never get to see the movie for the first time because of all the editing and such. And through my journey I now get to see the movie through the eyes of people who are seeing it for the first time. Someone told me that they had a depression and didn’t feel anything for the last months but the movie made them laugh and cry for the first time in nine months. I get messages like someone wanted to commit suicide and someone gave them the movie and now they want to live again. That’s huge! It’s very fulfilling to do this. When I was producing the movie, everyone asked me how do I know if people want to see the movie. And I said that I didn’t know. But it was the movie I wanted to see. And now there are people all over the world watching it! What’s the most unexpected and happiest experience you had since you made the movie? I am sure you had many, but is there one that’s particularly striking to you? I have so many! … God, there are so many … That’s a good question … Oh, okay! Do you know India.Arie? Yes! So I am a big fan of hers and she’s a big fan of the movie, so that was something really spezial. Thank you very much for this interview! Then I hope that many will be watching the movie or reading the book now.